My day trip to the Great Barrier Reef had finally arrived. Snorkeling the reef has been on my bucket list for as long as I can remember. It was strange to wake up in the morning and realize I would be ticking off another item in only a few short hours. I headed to the docks at 7:30 to start my tour. The group I went with was called Passions, and they have a beautiful, 80 person Catamaran that stops at two different diving and snorkeling sites during the day. I was ecstatic! It was pouring in Cairns that morning. Big surprise. But I’d be in the water anyways, so I figured it couldn’t be that bad. I hopped on the boat, had some coffee and a muffin and sat down to fill out my forms. I met an old English guy and a couple guys from Switzerland and joined them at the table. One of the Swiss guys had some sea sickness pills and offered them around. “You might want these” he said to us. But as the waves continued, the rains stopped. The sun came out, the clouds dissipated, and for the first time I really felt like it was summer in Australia! I moved outside where I met Simon, the skipper of the boat. We sat and chatted, as he tried to convince me to come diving with him instead of snorkeling. I would love to go diving. But my already tight budget simply wouldn’t allow it. The day trip itself was $160, and to dive was an additional $70. When I booked the tour at the hostel I asked the staff what they thought. It took 2 hours to get to our first dive site. 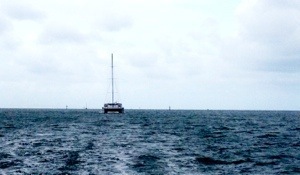 We were just off the coast of a small, sandy island in the middle of nowhere. The sun was shining and the water was an incredible turquoise. We got our stinger suits on, lined up for flippers and masks and headed in to the water. The stinger suits were worth every penny of the $8 they cost for the day. Not only was it stinger season in Cairns, but the suits protected against the sun as well. Something much needed for my winter skin. The whole way up the coast to Cape Trib I’d been told about the stingers in the water. During this time, right as the rains start in the summer season, the waters fill up with deadly jellyfish. If you’re going to swim off the beach, there better be stinger nets up. Unfortunately, the most deadly of the stingers, the Irukandji, is so small, it’s almost invisible while swimming. The size of one’s pinky finger nail, the Irukandji sting causes excruciating pain… It also can fit through stinger nets. These stingers are of course a little less common way out on the reef. Nonetheless, I wore a suit, and so did 90% of the people I was with. All suited up, I leaped into the water. The second I got under water I ran into two huge purple jellyfish. I jumped back a little, not sure if they stung or not, and not quite trusting the ultra thin suit I was wearing. Turns out, they were moon jellies, and totally harmless… Which is a good thing, because I literally bumped in to about 200 of them over the course of the day. The reef was stunning. As is to be expected from the Great Barrier Reef. But I was glad to find out that it did not disappoint. Huge angel fish, clown fish, parrot fish, and thousands of other species I could never name. The coral was huge and endless over the white sand. It’s difficult to explain, but I was overwhelmed everywhere I looked! Maybe it was the tour, or the day, but the best thing about the trip was how alone I was. No crowds, or bumping into other swimmers, it was just me, the reef, and hundreds of damn moon jellies (Which, even when I found out they were harmless, were still a little scary to bump in to). Part way through my first snorkeling stop I spied a massive sea turtle just cruising through the coral. I popped up out of the water to tell others to come see, but found myself alone. So I just casually followed him around for the next ten minutes or so, until he swam away from the reef and out into the sea. I can’t say I’ve ever seen a sea turtle that close before, and certainly not for that long! The turtle was very unphased at being so close to a human, and just kept swimming at a leisurely pace the whole time. After an hour and a half we came back to the boat. It was only 15 minutes or so to our next stop, but we had a big buffet lunch before continuing on. The next snorkeling drop off was equally as amazing. But at this stop, we saw a massive parrot fish. I had hardly dropped into the water when I first spotted it. The thing was huge. Probably close to 4 feet long! It was a little too low on the reef for me, but the divers below me were so close they could reach out and touch it. The fish hung out with them for quite a while, letting the group feed and play with it. The second stop we had about 45 minutes to check out the area. Still, I could have spent hours. When all was over and done with we started our trek back. 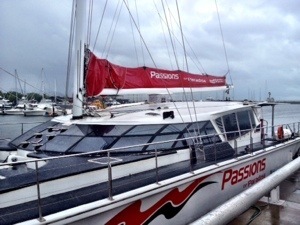 Normally, the catamaran sails back to Cairns, but with the weather in town, we had to motor. It was a much calmer, 2 hour trek home (thank god). We arrived back in the pouring rain at 5:15. Cairns had apparently seen no sunshine all day. Great day to choose a trip to the reef!! This entry was posted in Australia and tagged great barrier reef, so many fish in the sea!, Wonder of the World by hilarylust. Bookmark the permalink.